Hello once again. I have been absent from this blog for just on 2 months now family committments have prevented me from joining the girls at Sunny Challenges and Creations and I will be absent for a while longer unfortunately, but I will continue to take part in the challenges when I can. I am very fortunate to have such wonderful stamping friends in Kris, Vicky and Shirley. Shirley stepped into the breech on very short notice and I will be forever grateful to her for doing this for me. The sketch this week is bought to you by Vicky and beside the colour scheme of Early Espresso and Pink Pirourette we also had to use this sketch. 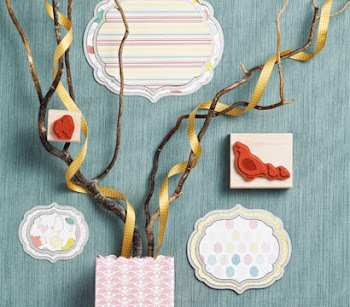 These are not two colours that I would normally gravitate to, and once I got my head around it I thought that a baby card would be great in this colour combo. I used as base of Early Espresso and then placed the Pink Pirourette Card stock on that. I used the Baby Bundle Stamp set and and also the Jumbo Baby Tees Wheel that matches that set. I used the wheel to run along the long strip at the side and used just enough of the wheel to show the top of the little playsuits. The three panels on the right hand side I ran through the Big Shot using the Perfect Polka Dots embossing folder. I also cut the large and the medium oval from the Ovals Die. The largest in Early Espresso and the medium in Pink Pirourette card stock. 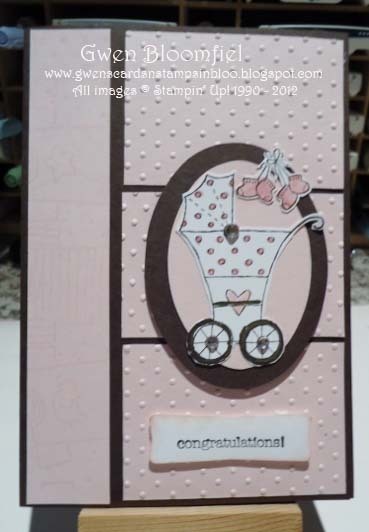 I stamped the baby carriage using Early Espresso and coloured the dots and the heart on the carriage using my Stamp and Write in the Pink Pirourette and the wheels of the carriage in Early Espresso. I then cut around the image attached it to the ovals and then added some Basic Rhinestones to the carriage just to add a bit of bling. I stamped two sets of bootees from the same stamp set, coloured them and cut them out and attached them to the top of the oval, The sentiment was stamped in Early Espresso on Whisper White and then punched out using the Modern Label Punch, which I cut the two little 'knobs' off, The main image and the sentiment were placed on Dimensionals. I love the way it turned out and hope you like it too! I have been able to do a couple of things and I will post them when I am able to have a bit of free time. They will be articles from the last 2 months that I have created. Till next time, happy stamping. I like this card Gwen. Never thought to make a baby card, but colours are perfect for it.